17th December 2012 / Simon Duffy / Comments Off on But, What Can We Do? The Englishman will interfere in the world, he will have his fingers in every trade pie, he will collect countries as he collects junk, but he cannot bear to see things chivvied about, and he will not tolerate being chivvied himself… We who are the least racial of all nations, who care least about folk-customs, are the most attached to tradition and old laws. Don’t chivvy things. I know only one constant exception to the rule against chivvying. The English people have always, incessantly and unmercifully, chivvied their governments: and for a very good reason. A government must be either servant or master. If you do not chivvy it, it may chivvy you. Dorothy L Sayers is well known for writing the Peter Wimsey detective stories; she is much less well known for being an excellent Christian theologian, feminist and translator. Her writings are always sharply realistic and radical (in its primary sense) while also being imaginative and rich. Some of you may not forgive her for her old-fashioned English prejudices, but, as this is from a wartime speech, perhaps most of you will. This passage stayed in my mind because of the idea that we must chivvy government unless we want to be chivvied ourselves. I wanted to use this idea to help me think about what we can actually do to challenge the outrageously unfair cuts and income reductions being targeted at disabled people. I have argued previously that the most extreme attack on disabled people in living memory is being disguised by the language of austerity. The reason that the cuts target disabled people is political, not economic, and it is rooted in the failure of the current democratic system to protect minority groups. I have also argued that the success of this intentional government strategy has been made possible because so many groups have become complicit with it (even if they privately disagree with it). Civil servants in the DWP, social workers, local authorities, voluntary organisations, charities and even some disability advocacy groups are all drawn into the business of implementing or (as some see it) ‘mitigating’ the impact of a fundamentally unjust policy. The lesson of history is that we rarely forgive those who try to justify their actions by claiming they were joining in with something wicked in order to make it a little less bad. As Sayers observation reminds us, the answer has to be political – and this can’t just be left to normal opposition politics. We must use every means available to chivvy our own government, and we certainly should not stop simply because they have managed to get unjust laws passed. The Labour Party has, so far, been muted in defending the rights of disabled people – but it has now agreed to hold an opposition day debate early in 2013 to discuss the government’s failure to assess the combined impact of its policies on disabled people. So perhaps we are seeing some new signs of moral life. Or perhaps the Labour Party is finally beginning to believe there may be some votes to be found in defending the rights of disabled people. Whatever the reason, it is vital that we do whatever we can to make the cause of disabled people politically attractive. This means presenting politicians with what they value: statistics and stories – particularly when the latter comes with attractive photo opportunities. So, Strategy One must be to make our case in terms that can be used by supportive politicians. This does not just have to be the Labour Party. Nationalist parties, the Liberal Democrats and even the more thoughtful members of the Conservative Party need the ammunition by which to fight the necessary political battles. The media have also been very disappointing in their coverage of the assault on disability rights. Coverage has been negligible and confused. Even serious journalists like John Humphrys have been fooled into taking the idea that the government’s welfare reforms are serious attempts at reform. Few seem to follow the logic of the government’s declared fiscal intentions. You cannot reduce poverty, reduce inequality or improve incentives for the poorest by cutting the benefit bill. The answer lies in radically redesigning the whole tax and benefit system. The coverage of social care has been even more extraordinarily complacent. In 2010 the government declared it was ‘protecting social care’, while putting in place a budget that ensured social care will be cut by 33% in real terms by 2015. Already over £4 billion has been cut from services for children and adults with the highest needs. Yet no journalist seems to have thought that this act of deception was a story worth telling. 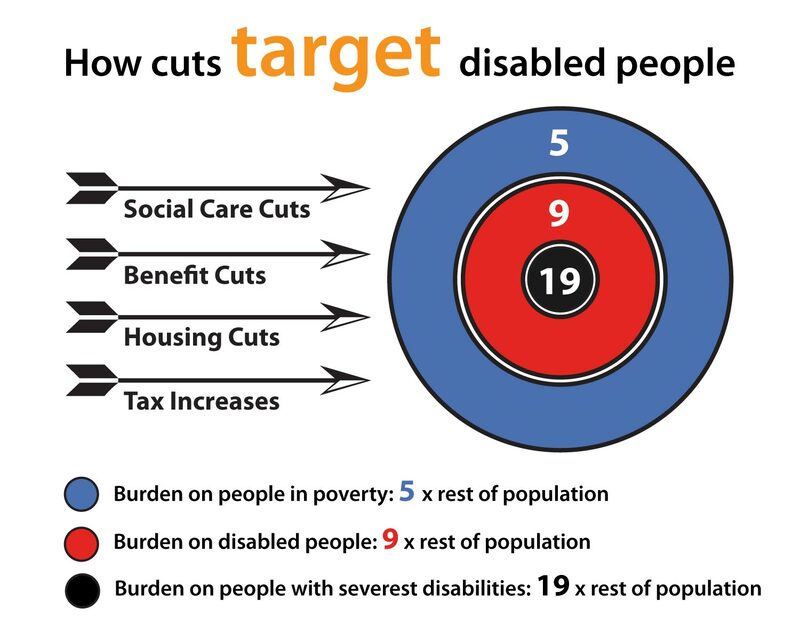 I have now completed a major report on the cuts, and how they target disabled people. I produced this report on behalf of the Campaign for a Fair Society because I believe we need to support campaigns like this, ones that offer a positive alternative to current injustice. But again, there are signs that the times may be changing. There are now growing numbers of media stories about the impact of the cuts on disabled people. The nonsensical claim that our economic woes can be solved by taking money from the poorest, to pay off debts created by the better off, is also starting to appear even more absurd as the economic crisis continues. So, Strategy Two must be to help journalists to find the stories that will engage newspaper readers and television watchers. Statistics and human stories are likely to matter most. But we also need to support and encourage any spokespeople from the disability movement who can effectively connect to ordinary people’s concerns and to help people see through the lies and statistical manipulations the are being used to justify these cuts. The Spartacus community and their many friends are already showing us how effectively this can be done, even on very limited resources. However this touches on one of the most profoundly difficult issues that the disability movement will need to address: who are its leaders? The problem of collusion is here acute, because many organisations have found themselves so dependent on government funding that they dare not speak out against what is happening. Moreover, many organisations, who might appear to be independent of government, are really satellite organisations – effectively owned and controlled by government. Some of these organisations, big charities, quangos and sub-contracted consultancy organisations, present themselves as speaking for disabled people, older people, social care, or whomever. But they have been been utterly quiescent. It may be useful to picture this problem in more old fashioned terms. The king always has noblemen and courtiers, who jealously guard their access to the king and who try to act as the conduit by which messages from outside reach the king. No courtier worth his salt would allow a common peasant to gain access to the king and to present his case directly. Moreover, in fairy stories, the sign of a good and just king has always been that he would not allow himself to be blinded by the encircling courtiers who compete for his attention but would always speak directly with his people. So, Strategy Three might be to make collusion with government more expensive and less attractive. For instance, organisations who have failed to adequately represent the interests of those they should be protecting could be named and shamed. A boycott could be organised of any organisation that declared itself to be representing disabled people, but which did not meet a reasonable standard for honesty and forthrightness. In other words, we should not put up with quangos and charities that don’t chivvy. Another approach that we could explore is direct action. Getting large numbers on the streets certainly may help – but is unlikely to be decisive. (Reductions in disability income also make it harder and harder for people to be able to take this kind of direct action.) Perhaps the key is to focus on areas where the madness of the government’s strategy is easiest to expose. Government jails people (at £40,000 per head) for refusing to pay a grossly unfair tax (far more unfair than even the poll tax) and one that costs almost as much to collect as it actually raises. Historically the refusal to pay an unjust tax has often been an effective form of civil resistance. But perhaps there are better forms of direct action and perhaps, if we are lucky, the public will finally wake up to what is being done in its name without such extreme methods. To end, I want to return to my wartime theme and two important, but relatively unknown, events. Few people seem to know that the Holocaust began with attacks on disabled people. In fact the first gas chambers were designed for disabled people. Only after murdering over 100,000 disabled people inside institutions were these gas chambers packed up and sent East to the concentration camps, to be used on the Jews. It was strange and disturbing to notice that, when a short documentary on eugenics was presented during the BBC 2012 Olympics, no mention was made of these facts. Most people also do not know that Denmark, despite being occupied by Germany, managed to protect almost all its own Jewish population, and also the Jews that had fled there from elsewhere. The Danes can be very proud that they did not collude, they resisted. When the Germans finally imposed martial law in order to murder Jews living in Denmark there was widespread action to hide and protect people, with Danish fishermen taking many to protection in Sweden. Even living under martial law, Danish civil servants harried their German counterparts to ensure that captured Jews were sent to the Theresienstadt. In the end only 51 were killed. This may seem an extreme way of presenting our options, but this is our choice. We will either collude, and go quietly along with government, deciding that our own jobs, homes and families are more important than them, disabled people. Not realising that the them are us. Or we resist. We find the courage to stand-up for others, even when they are do not seem the same as us. There is no middle ground which isn’t collusion. So, Strategy Five might be to find some form of campaigning which would enable many more people to express their revulsion at what is being carried out in their name. To do this we need to reach out beyond our own networks and groups and to get into streets, markets and homes. Perhaps it would be worth using an old fashioned method like a national petition which we could get hundreds of thousands to sign. Developing such a petition would even be a good mechanism for distinguishing the groups that were prepared to resist from the groups that were happy to collude. We call on the government to reverse the Welfare Reform Act, to increase social care funding in line with funding for the NHS, to end the disability tax (so-called social care charging) and to redesign the welfare system so that its fair for everyone. I am sure someone else can do better than this – but I do think its time to clarify what we are fighting against and what we want in its place. We cannot chivvy government without some powerful and clear messages – and messages that could have political impact. We also cannot make this work without real people in local communities being able to organise and lead practical campaigning. But here the disability movement does have strength. For example, in Doncaster (the seat of Ed Milliband) the are at least two active, utterly independent and powerful groups: Active Independence and the Personalisation Forum Group. If groups like these could join together in a national network around some shared messages then the impact could be very powerful.